Mark conceived and has been working on the South Wales Metro project since 2010 and in 2017 outlined proposals for a ‘Swansea Bay Metro’; he is currently leading the development of strategic business cases for the Welsh Government on further rail investment. Mark has written previously in Rail Professional (October 2017, issue 236) regarding the Swansea Bay Metro. As this issue of the magazine focusses on franchising I wanted to get Mark’s views on the Williams Review and what he hopes will be the outcome for Wales. What are your thoughts on the Williams Review? Yet again the UK rail industry is subject to a forensic review of structure and performance. In the last ten years we have had McNulty (Rail industry efficiency), Laidlaw (WCML franchise failure), Brown (post Laidlaw rail franchising and risk) and Shaw (The Future of Network Rail). Before that the now archived Eddington Study took a more holistic look at UK Transport and produced a very good report which stressed the economic important of intra-city/region connectivity. There are probably others. We also have the framework for rail in the UK set out by the DfT in their vision paper in 2017. Now we have Williams whose perhaps narrower remit focussed on organisational and commercial frameworks but not infrastructure and services, overlooks a more important issue for us in Wales, investment or lack thereof. I support Williams and hope, as I am sure many others do, that we navigate a route out of our current ‘franchising difficulties’. However, I think (my assertion) that perhaps and certainly from a Welsh perspective, bigger issues are being overlooked and some obvious truths understated. What are these bigger issues that you believe are being overlooked? On the latter and whilst I have no doubt there are weakness in the current system, the biggest problem that I can see in UK rail have been failings in execution; specifically: specification, procurement and contract management. Unless we address the underlying causes of this phenomena, we will still have a problem no matter how we are organised and incentivised. I think Brown touched upon this in his 2012 report. More relevant, it seems to me, decisions on rail investment in enhancements and services (which is the important thing as far as the passenger is concerned – not how we organise the industry) are often completely divorced from wider planning considerations. How many Local Development Plans are really considered at the heart of rail planning – or vice versa for that matter. I would argue not; rail planning has become a bit of a centralised ivory tower exercise. The traditional industry ‘five year’ soviet style plan and the seven or 15-year franchise, which has been the norm for years – reminds me of a Pravda published fiveyear grain harvest plan – has not helped and changes to that approach are to be welcomed (without damaging the need for strategic and longer-term thinking). This is not just a rail industry issue, it is a UK planning issues (including in Wales). Too often we see major developments (houses, retail, schools and hospitals) built in locations with poor public transport access (rail and/or bus) and with no refence to rail planning. We need some thought applied to address this issue; climate change and sustainability demand we plan and build better places that reduce our dependency on cars and reduce barriers to public transport. We are trying to break that mould in Wales through the work of Transport for Wales and the Office for Future Generations. How about issues that are specific to Wales? In Wales we also have some serious issues I am not sure Williams will fully address. The commercial and organisational issues are secondary for me. There is a more fundamental issue (due to the fact that, unlike Scotland, rail infrastructure is a non-devolved matter) is a long-term lack of investment. In May last year the Cabinet Secretary for Economy and Transport, Ken Skates, announced that I would lead a programme to explore the strategic case for rail investment in Wales. Since then I have been working with Welsh Government officials, stakeholders and others to explore the potential wider benefits that could be realised; my report was published in November 2018. The emerging reality is that although new improved rolling stock will be delivered and operating across the UK over the next few years, disappointingly, these vehicles will only be able to operate in ‘second gear’ at best in Wales. There are over three million people living on the corridor from Swansea through Cardiff to Bristol. There are two trains an hour between Cardiff and Bristol Temple Meads (BTM), taking nearly an hour and none from Swansea to BTM. NR have also set out in their route planning that the market for rail services between Leeds and Manchester is broadly similar to that between Cardiff and Bristol Temple Meads. Figure 2: A Western Powerhouse? The former already has six trains per hour and is subject to a £3 billion Transpennine upgrade. 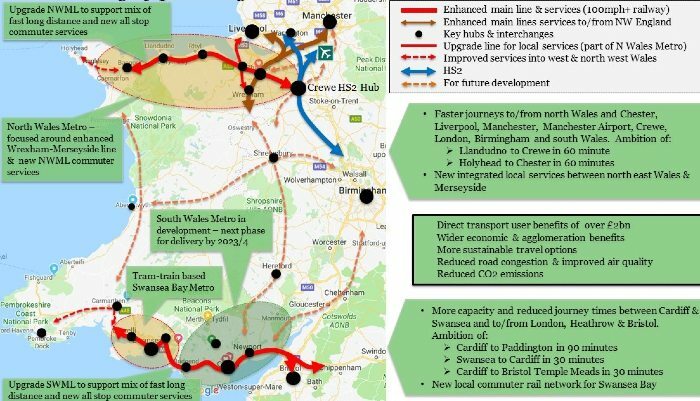 The UK Government’s ambitions for a ‘Western Powerhouse’ (See Figure 2) have limited chance of success with such poor rail connectivity between Swansea, Cardiff and Bristol’s city centres. The line speeds and capacity of the north Wales mainline is also similarly constrained. For the two main lines in Wales to be restricted in their capability in comparison with the mainline railways elsewhere in the UK is at best questionable and points to an institutional weakness in the process that determines rail investment in the UK. Where should investment be focussed? Do you think Wales gets an appropriate amount of investment overall? I am particularly concerned about the long-term lack of enhancements (which are typically focussed on improving network capability, reliability and capacity) and the stark fact is that the Wales route (eleven per cent of the UK network) has not received an equitable proportion of UK rail enhancement investment over many years. Since 2011, the figure has been a little over one per cent of the UK total and this disproportionality low level of enhancement investment actually goes back much further, decades in fact, as a review of Network Rails historical High-Level Output Specifications will demonstrate. This at a time when the UK is committing £56 billion to High Speed 2 (for which there is no Barnett consequential for Wales as there is in Scotland – which actually benefits from the scheme) and potentially £39 billion to Transport for the North over the next 30 years to deliver major schemes like Northern Powerhouse Rail (NPR). I originally raised the issues related to HS2 and its economic impact on Wales in my submission to the Westminster Transport Committee’s review of High-Speed Rail in 2011. What causes this disparity in enhancement investments? I believe that there exists a fundamental bias impacting the method by which rail enhancement investments are determined across England and Wales by the Department for Transport (DfT) in London, which has responsibility for such matters on an England and Wales basis. It would appear some parts of the network have been locked into a virtuous cycle of ongoing enhancement whereas some parts have been completely overlooked over many years. It’s easy to see why – investing in more reliability and capacity generally leads to more demand and so pressure on capacity and reliability, leading to a stronger case for further enhancement investment (The £9 billion WCML upgrade generated a significant uplift in demand which has helped the case for HS2). If your network is not on this ‘enhancement conveyor belt or has a smaller economic case for enhancement it will always get swamped by the big-ticket items. This is an issue for Wales (and other parts of the UK); as any business knows, you can’t compete and maintain margins if you operate on depreciated assets when compared to your competitors. The result is a less efficient railway with lower capacity in Wales versus the UK as a whole, leading to lower demand and higher subsidies per passenger; more worryingly it is also having a detrimental impact on the Welsh economy. My conclusions, which are consistent with the findings of both the Welsh Affairs and Transport Parliamentary Select Committees at Westminster, is that enhancement investment is needed, is justified and can deliver economic benefits; the initial proposals set out in my work for Welsh Government could contribute, conservatively over £2 billion to the Welsh economy. Wales’ economy needs faster and more frequent services between its major towns and cities and to other key UK commercial centres such as Bristol, London, Manchester, Birmingham, Glasgow, Edinburgh, Leeds and Liverpool as well as to major international gateways like Heathrow and Manchester airports. What improvements do you hope to see on the different routes in Wales? 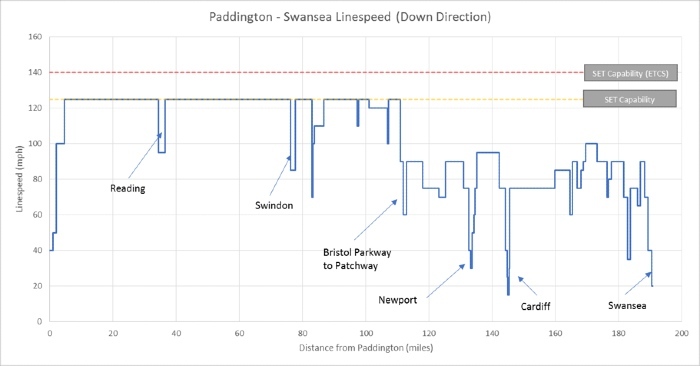 Our ambition (See Figure 3) is to see our main lines operate at 100mph or above enabling journey times of: Cardiff to Paddington in 90 minutes, Swansea to Cardiff in 30 minutes, Carmarthen to London in 3 hours 15 minutes, Cardiff to Bristol Temple Meads in 30 minutes, Holyhead to Chester in 60 minutes and Llandudno to Crewe in 60 minutes. We need to upgrade the SWML and create a 100mph railway from Bristol through Cardiff and Swansea into Carmarthen and Pembroke in west Wales, we need to expand the South Wales Metro and develop metros in Swansea Bay and NE Wales. The long overdue Western Rail access to Heathrow would also help. I think it’s a glaring devolution anomaly that the Welsh Government does not have responsibility for rail infrastructure in Wales. It is overwhelming clear that the current England and Wales arrangement, under the stewardship of the DfT in London, has not served Wales well. This is a bigger issue for me than Williams. Full responsibility to develop and implement schemes in Wales must fall to the Welsh Government and in doing so the UK Government must recognise that sufficient funding needs to be transferred to discharge these responsibilities and to address many years of ‘underinvestment’. The UK Government has already established similar arrangements via Transport for the North, and Scotland secured this arrangement, which included a block grant adjustment, over ten years ago. Is it too much to ask for Wales to get the same treatment? Getting back to Williams, what are some success stories the Review can draw from in Wales? I think there may be learning opportunities from how the Welsh Government and Transport for Wales have approached the development and procurement of the South Wales Metro. For example, the output-based procurement used to secure the Wales and Borders franchise in 2018, the capping of profits in that contract and the transfer of the core valley lines to TfW from NR to be managed as a single vertically integrated railway by the operator. All potentially can lead to better outcomes for both passenger sand taxpayers – let’s keep a watching brief as there could be lessons for other parts of the UK. Looking more broadly I think we need to change how we plan transport across the UK so that it is better integrated with wider planning processes; I would go further and say that aside from planning and maintaining the main lines in the UK (which NR should perhaps lead) that local rail planning should be much more aligned (and perhaps integrated) with city region and local authority transport planning – this is theme that emerged from more than one of the recent reviews. However, as I opened, I think for Wales and the UK as a whole, the real test will come down to how well we execute. So, investing in ensuring we execute as well as we can is perhaps as, if not more important, than how we are organised. I also confidently predict that given the current rate of UK Government rail reviews we will have another one in progress by 2025! 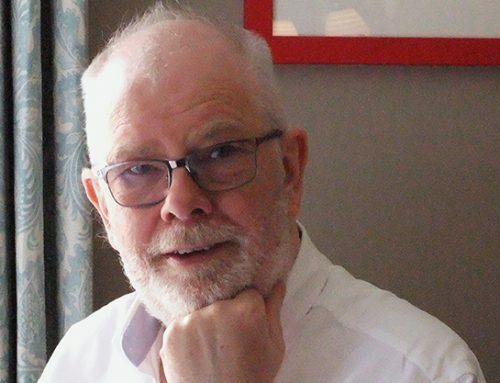 Mark Barry is Professor of Practice in Connectivity at Cardiff University’s School of Geography & Planning. You can reach him using the below contact information and read his blog via the link.